Fans causing unrest at the game between Brighton and Crystal Palace on Tuesday risk spoiling future matches for the well-behaved majority, according to the Football Supporters' Federation. Sussex Police branded the disturbances a "return to the dark days of football" as fans without tickets tried to force entry into the Amex Stadium. Six people, including one 15-year-old boy, were arrested, while two stewards - one from each club - had to be taken to hospital, one with three fractured ribs. Both stewards were discharged later on Tuesday night. A statement from the FSF read: "It's clear from witness accounts and video footage that a number of Crystal Palace fans 'stormed' the turnstiles at the Amex Stadium on Tuesday night. "There is no excuse for such behaviour and the FSF condemns these actions and reiterates our anti-pyro(technic) stance. "Many of the fans who reported this to us are match-going Crystal Palace fans with tickets who fear that they will suffer the consequences of such behaviour. "That can be at future fixtures via reduced away allocations or on the night of the game due to additional policing measures as happened on Tuesday. "We are concerned at the number of ordinary, peaceful fans who are coming forward and saying they had tickets but were denied entry. They deserve answers and recompense too. Chief Inspector Simon Nelson, who led the policing operation for the fixture, described how ''groups of masked people'' sought confrontation and supporters tried to get into the ground with ''pyrotechnics, knives and knuckledusters''. Nelson also revealed how a large number of people, seemingly without tickets, over-ran turnstiles in the ground's south stand to force access to the away supporters' section. Disturbances also broke out at Brighton railway station, where frustration grew among fans set to miss the start of the match. Palace said there are clear images of the disturbance and that fans involved will face stadium bans and possible criminal action. 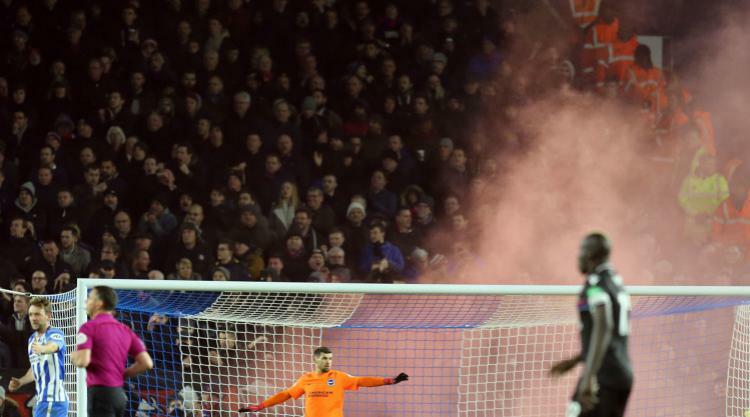 A Crystal Palace statement read: ''We have been made aware of a small group of supporters attempting to gain access to the Amex stadium last night without tickets while using bangers and flares. ''This kind of antisocial and criminal behaviour is completely unacceptable and we condemn it in the strongest possible terms. ''There are very clear images of the incident and we will work with the police to identify the supporters involved, who will face stadium bans as well as potential criminal proceedings." Brighton chose to close the stadium's turnstiles at 7.51pm, six minutes into the match, which finished goalless. That decision left some fans with legitimate tickets locked outside the ground, and they were escorted back to the railway station and sent back to London. Palace said supporters with unscanned tickets, who were denied entry to the match, could contact the club for a refund.